Honduras and Nicaragua disputed the border at the South-east corner of Honduras for 25 years. The dispute was finally settled in favor of Honduras by the International Court of Justice in 1960. The dispute moved into the philatelic area when Honduras issued the stamp below which asserted Honduras' claims to the territory in 1935. The stamp issued in 1943 renewed the Honduran claim to the territory also claimed by Nicaragua. The only city identified on the map is Tegucigalpa, the capital of Honduras. 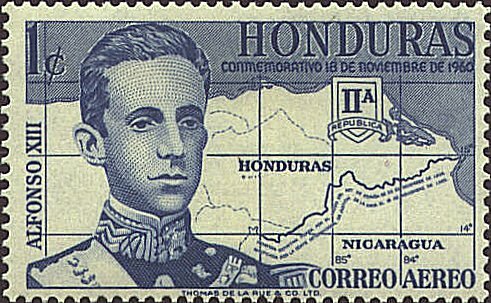 One stamp of a set of six airmail stamps issued by Honduras to mark the judgment of the International Court of Justice at The Hague returning disputed territory from Nicaragua to Honduras on November 18, 1960, features a portrait of King Alfonso XIII of Spain, whose decision in 1906 was ratified by the ICJ, and a map of the border decision. Nicaragua had refused to accept the decision by King Alfonso in 1912, and continued to object to portions of the decision of the ICJ up to 2003. Other stamps in the set feature copies of the decisions in 1906 and 1960 and pictures of Honduran Presidents of 1906 and 1960.